It's cool to make your own foam stamps with craft foam alphabet letters, foam board and Aleene's Max Tacky Adhesive. Stamp a pretty plaque with your favorite inspiring words, add some layered buttons and you have pick-me-up wall art! 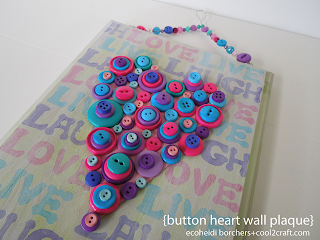 Watch Heidi's Button Heart Wall Plaque YouTube video tutorial! Visit the creativity sisters Heidi Borchers and Tiffany Windsor at Cool2Craft on Facebook! Watch our video tutorial archives on YouTube! Get creative! Get inspired! Be cool!